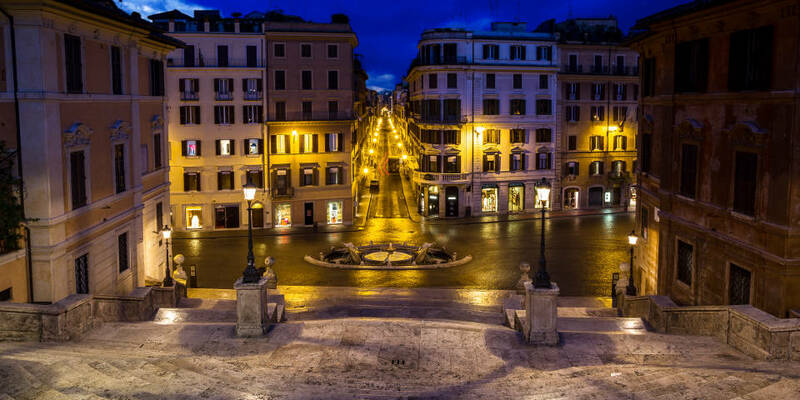 The Spanish Steps is an unusual architectural gimmick, which is considered as one of Rome top attractions. The cascade of polished stone stairs majestically descend from the top of Pincian Hill right to the foot of Spanish Square (Italian: Piazza di Spagna). 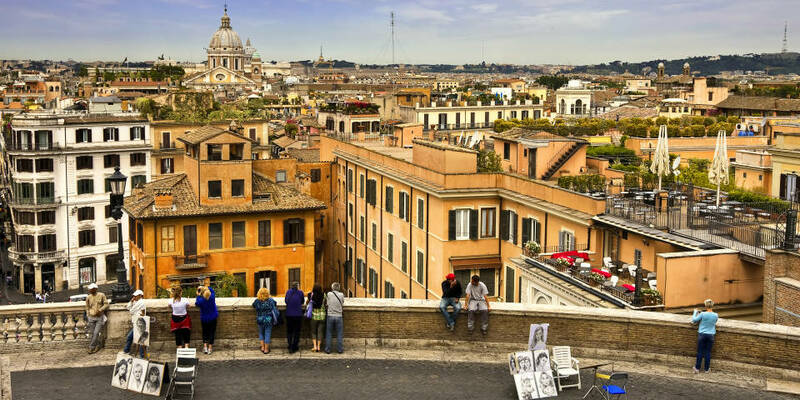 This sightseeing is one of the unmatched architectural landmarks of Rome. Wide baroque steps attract thousands of visitors of the Italian capital and serve as a main source of inspiration to cinematographers and artists. Such modern fashion houses as Prada, Dolce & Gabbana, Bulgari, Dior prefer to place their boutiques within easy reach to this grandiose construction. Getting enough from contemplation of smooth travertine steps, travellers will definitely take an interest in learning more about the history of the place. 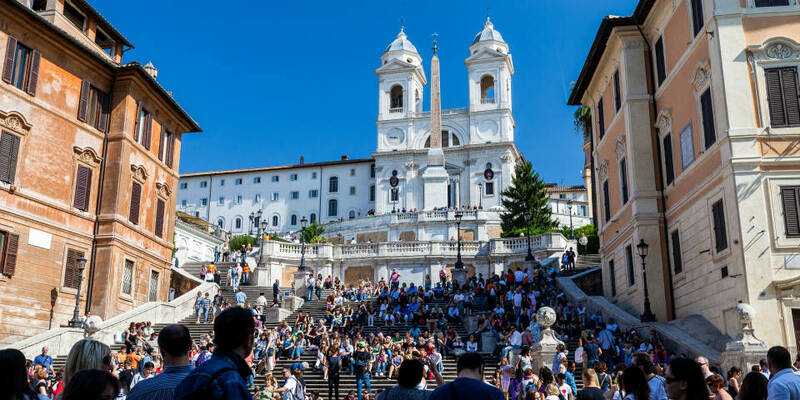 The most interesting fact of the biography of this sightseeing is its name “Scalinata di Trinita dei Monti” which means in English “the stairway to the church of Trinita dei Monti”. In fact, the mysterious Spaniard has a really ambiguous history based on the struggle of french and spanish spheres of interests on the territory of Italy. The titular church Trinita dei Monti, that towers on the Pincian Hill was constructed with the help of Louis 12 in the 16th century and immediately became a stronghold for the french nationals who lived far away from their homeland. At the same time the Spanish Square at the foot of the Pincian Hill also played an extremly significant role for the Spaniards , while the spanish embassy was located there. Despite not only being married to Maria Theresa of Austria, but also having close kinship to the spanish monarchs, Louis 14 had quite strained relations with neighbourhood countries. 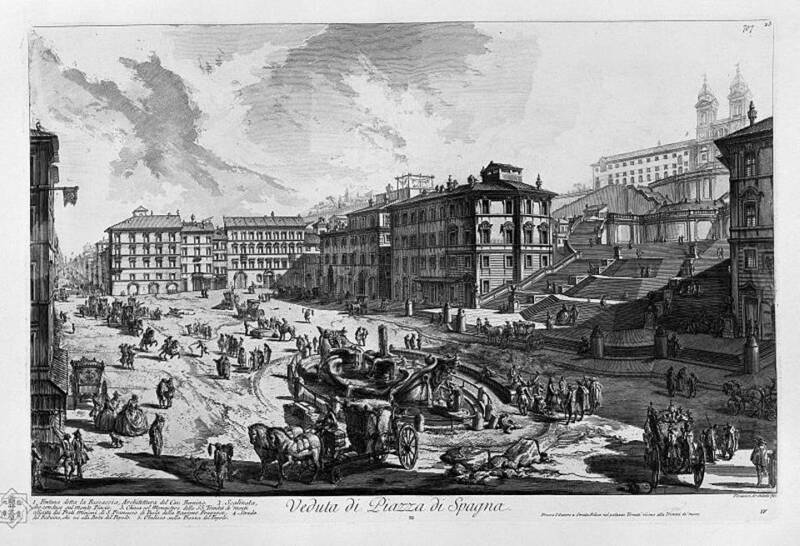 Ultimately, French political leader Etien Geffie decided to eliviate the tension and fix the situation by constructing the stairway, which was aimed to connect Trinita dei Monti church and Spanish Square. All in all, it cost Geffie about twenty thousand scudo so as to bring to life such a symbolic idea in Rome. Concerning the initial plan the Spanish Steps should have become grandiose and highly pretentious architectural complex. The only point at issue was an equestrian statue of Louis 14 on the top of the edifice. But the Roman government considered themselves insulted and put a veto on the construction project. Only in 1717 the competition among the architects was declared and the creative dyad of Alessandro Specchi and Francesco de Sanctis won the right to carry on the project. The works started in 1723, but the majority of time was spent on the pre-construction activities such as forming the ground of the hill and underpinning the square. For almost two years the group of builder and constructers worked their fingers to the bone to bring up 138 travertine steps. As a result the stairway got its wide central part framed by two narrower sections. There is a viewpoint closer to the top of the hill, where one can get by one of the half-moon side spans. Each side of the stairway is fenced with stone ledges designed in italian baroque style. That time the architects decided to decorate the stairway in a more modest way with the heraldic symbols of the Burbons dynasty along with the traditional images of the crown and eagle – the attributes of pontifical power. Since 1725, when the construction was over, till 90-es of the 20th century the Spanish Steps didn’t undergo any serious reconstructions. However, dilapidated steps and time-eaten stones cankered by rain and dirt didn’t retain much romance anyway, so municipal government found the finance to renovate this heritage asset. And in 1997 revived and refreshed sightseeing regained to the tourists’ list of most popular landmarks of Rome. And again huge flows of the travellers draw to one of the most majestic and beautiful stairways in the whole Europe. Every year, when spring comes, the flowerpots with azaleas and petunias paint the stairway in pinkish and flamboyant colours. While in winter the same wide steps become the stage for short christmas plays. Moreover, Trinita dei Monti church is a very picturesque background to the Spanish Steps. In addition to this, the interior of the church deserves attention as well. One of the most famous exhibit that the temple can boast about is a statuary “The Descent from the Cross” performed by the apprentice of Michelangelo Daniela de Valtera. An unhasting walk upwards the stairs will also uncover the travellers a magnificent view on the Spanish Square and adjacent streets. A building that is located at the foot of the stairs on the right is a house museum devoted to english romantic poets John Keats and Mary Shelley. It is said that young Keats exuberantly declared his poems to a successful woman and writer, Mary Shelley, walking along the stone steps of the famous architectural monument. 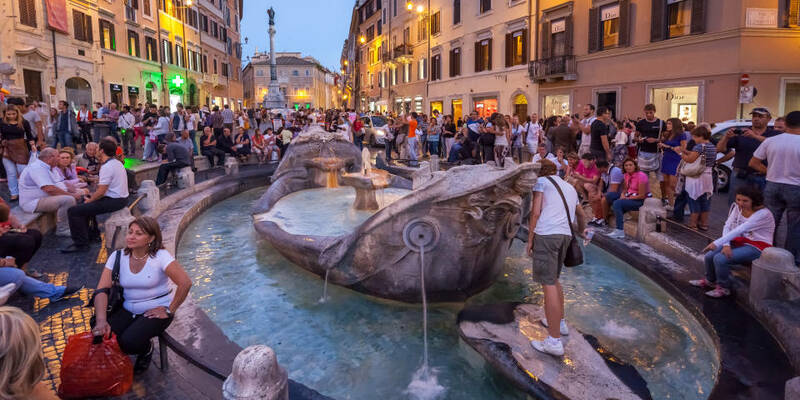 The Spanish Steps allows the visitors to overlook the Fountain of the Old Boat (Fontana della Barcaccia) which is a main decorative element of the Spanish Square. A prominent sculptor, who created the fountain at the beginning of the 17th century, was Pietro Bernini. There is a widely-known legend that once the overflown waters of the Tiber river cast ashore the remnants of the fishing boat, that inspired the master and provided the basis for such a peculiar composition of the fountain. 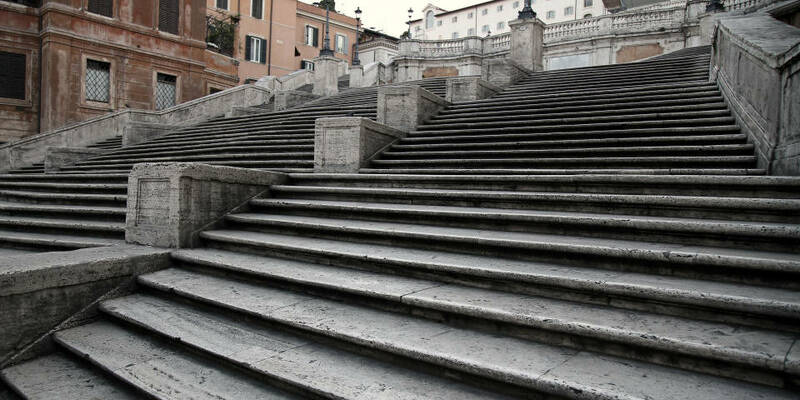 No matter how lofty it may sound, but the Spanish Steps in Rome even have their own filmography. For example, in the movie “Roman holidays” delicate and refined Audrey Hepbern enjoyed an ice cream sitting on the famous stairs. Not to mention that many Italian films cannot do without the views of Rome and especially shots made from the Pincho Hill. Fashion shows, parties and other inredible events of high fashion industry organised by Valentino, Dolce&Gabanna and other well-known designers can be also added to the long list of merits and credentials of this amazing and extrodinary beautiful sightseeing. Bus: № 117 (bus stop: Trinita dei Monti).